10.1 As outlined in Chapter 3, the Parliamentary Budget Office's (PBO) submission provided a detailed state-by-state breakdown of the difference in Commonwealth hospital funding between government's policy announced in the 2014‑15 Budget and the former government's hospital funding arrangements under the National Health Reform Agreement 2011. The government's 2014‑15 Budget marked a fundamental policy shift away from the previous government's activity based funding model, which established a national efficient price for hospital services. Instead it reverts to the former block funding model based on CPI and population growth. 10.2 It is clear from the PBO's figures that the ACT will suffer a decade of significant hospital funding shortages due to the government's abandonment of the carefully negotiated national health agreement. 10.3 Over the eight year period from 2017-18 to 2024-25, the PBO found that the ACT would have a total of $1.7 billion cut from its hospital funding due to the government's 2014-15 Budget. The annual funding differences are set out in Appendix 4. 10.4 By the end of the period examined by the PBO (2024-25), the $356 million of funding that the government will to remove from the ACT hospital budget would be greater than the entire Commonwealth hospital funding allocation to the ACT for the 2015-16 financial year of $316 million. The Commonwealth Government’s abandonment of the National Health Reform Agreement has cut $248 million from what we expected to receive for our hospitals over the next four years. In this Budget we have chosen not to pass on this Commonwealth cut and send our hospitals into chaos. We have instead met the funding gap left by the Commonwealth by increasing our budget deficit. We believe Canberrans should not suffer inferior health services because the Commonwealth Government has abandoned its responsibilities to our community. We will continue to campaign for the restoration of our share of the national growth in public hospital funding. 10.6 The committee commends the ACT Government for refusing to pass on the immediate impact of the government's funding cuts to public hospitals in Canberra. 10.7 However, the committee believes that the ACT Government cannot continue to cover the Commonwealth's planned funding reductions, which will grow steadily over time to a total of $1.7 billion by 2024-25. 10.8 Long term funding certainty allows for better planning for infrastructure, managing staffing, waiting times and lists, and delivers increased efficiencies overall. When hospitals are forced to operate on year-to-year budgets, there is no capacity for planning ahead and making efficient investment in staff and services. 10.9 The ACT hospital system is in desperate need of efficiencies. When the National Hospitals Performance Authority's recent report into the costs of acute admitted patients in public hospitals from 2011-12 to 2013-14, the ACT's two public hospitals were in the top 10 per cent. This means that acute care in the ACT's public hospitals costs twice as much as in other states. 10.10 The committee believes that without long term funding, state and territory public hospitals will not be able to achieve efficiencies and adequately serve Australians. The committee calls on the Federal Government to create a long term, sustainable, funding model for hospitals which allows for appropriate contributions from governments, both state and federal. Mental health advocates, services groups, and experts spoke at the committee's public hearing in Canberra on 26 August 2015. 10.11 As outlined in Chapter 3, the PBO's submission provided a detailed state-by-state breakdown of the difference in Commonwealth hospital funding between the government's policy announced in the 2014‑15 Budget and the former government's hospital funding arrangements under the National Health Reform Agreement 2011. The government's 2014‑15 Budget also marked a fundamental policy shift away from the previous government's activity based funding model, which established a national efficient price for hospital services. Instead, it reverts to the former block funding model based on CPI and population growth. 10.12 The PBO's figures show that the Northern Territory will lose around $1.0 billion in hospital funding over a decade due to the government's abandonment of the carefully negotiated national health agreement. The annual funding differences are set out in Appendix 4. 10.13 Shortly after the 2014-15 Budget cuts were announced, the Northern Territory Chief Minister, the Hon Adam Giles MLA, participated in an emergency meeting of states and territories to discuss the funding cuts. 10.14 In a media release about the funding cuts, the Chief Minister said that the Northern Territory would lose $652.2 million in health funding over the decade to 2024-25, a shortfall 'equivalent to 60 hospital beds or a Palmerston Hospital'. 10.15 Two years after the 2014-15 Budget cuts decision, the AMA's Public Hospitals Report Card found that smaller states and territories, including the Northern Territory, were struggling to meet hospital performance targets. Burden of disease: an increasing gap between the general Australian population and Indigenous people from remote areas of the Northern Territory. The submission notes that the total burden of disease is 3.5 times greater for Northern Territory Indigenous people than the national burden. Indigenous patients have greater numbers of co-morbidities than the average, which impacts both on the initial reason for admission and the care required. Transport plus accommodation, approximately $740 (double cost if a partner escorts the patient)—this includes transport to the airport; light plane to Katherine; collection from Tindal Airport and transport to Katherine Hospital; chest x-ray; night's accommodation in a hostel; and a return trip. ...over time, in an imbalance in the amount of Commonwealth funding that is directly provided to the NT to provide services. When we moved into the current funding model around activity based funding in particular, over time that Commonwealth imbalance would have been addressed simply because it was moved into a normalised funding model. The major difference for us in terms of funding under the current model, as opposed to the per capita model, is that factors such as remoteness and Indigenous status are recognised and funded at a differential rate. So, if that system were to stop and we went back to per capita funding, the allowances and loadings we currently get for being Aboriginal, effectively, or being in remote or very remote areas would cease, and the burden of that funding would probably fall back on the Northern Territory. The major impact for us going into the future is that ABF component. In terms of our current budget, our total budget for the NT will be up to $1.4 billion a year. So the $650 million over the period of 10 years is $65 million a year, which is around about five per cent. So it is a fairly significant portion. There are a lot of demands on funding in small population places like the Northern Territory. Without targets, without limitations on what government can do and without shared responsibilities we will continue to see decisions made that may move funds away from health to other more immediate priorities of government, and I think we will see a decline in health status. If you look population-wide at the Northern Territory, we are the only jurisdiction that is on track to achieve the COAG target of closing the gap in life expectancy. That is largely down to improvements in primary health care... If we have significant changes to health funding in the Northern Territory, that will not happen. We will go on to a different track. CHAIR: So significant changes, whether it is in the acute or the primary setting, the whole thing is so intertwined that any change at any point will lead to negative outcomes. Ms McLaughlin: Yes, and it will risk that—that we will not achieve that closing of that gap in the Northern Territory. ...reduce acute and specialist care to Aboriginal people. Northern Territory hospitals are already performing below national benchmarks, mainly due to the high demand for acute care. The majority of hospital patients in the Northern Territory are Aboriginal, so reducing access to high quality hospital services will hurt Aboriginal people the most. 10.21 The committee believes that the Northern Territory is not well placed to sustain the funding needed for adequate hospital services by itself. By 2024-25, the Commonwealth's planned funding reductions will have grown in total to approximately $1.0 billion for the Northern Territory. 10.22 Smaller states and territories have fewer resources to draw on, and the Northern Territory in particular faces the added challenge of delivering services over large distances to remote populations, often with high proportions of indigeneity. 10.23 Long-term funding certainty allows for better planning for infrastructure, managing staffing, waiting times and lists and delivers increased efficiencies overall. When hospitals are forced to operate on year-to-year budgets, there is no capacity for planning ahead and making efficient investment in staff and services. 10.24 The committee believes that without long-term funding, state and territory public hospitals will not be able to achieve efficiencies and adequately serve their citizens. The committee calls on the Federal Government to create a long-term, sustainable funding model for hospitals which allows for appropriate contributions from governments, both state and federal. 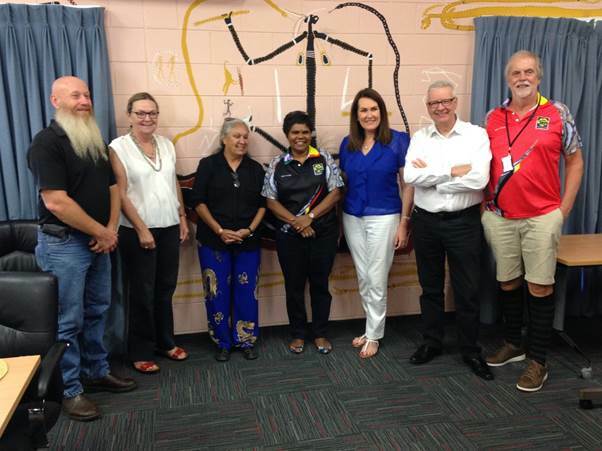 The committee visited the Wurli Wurlinjang Health Service in Katherine, Northern Territory on 29 April 2015.